Covering an impressive 183 acres, Greenwich Park is London’s oldest enclosed Royal Park, with royal connections dating back to the fifteenth century reign of Henry V. Notably, Henry VIII was born in Greenwich and introduced deer to the Park; there is still a deer enclosure today (on the Blackheath side of the Park, near the Flower Garden) where you can see red and fallow deer and other wildlife. 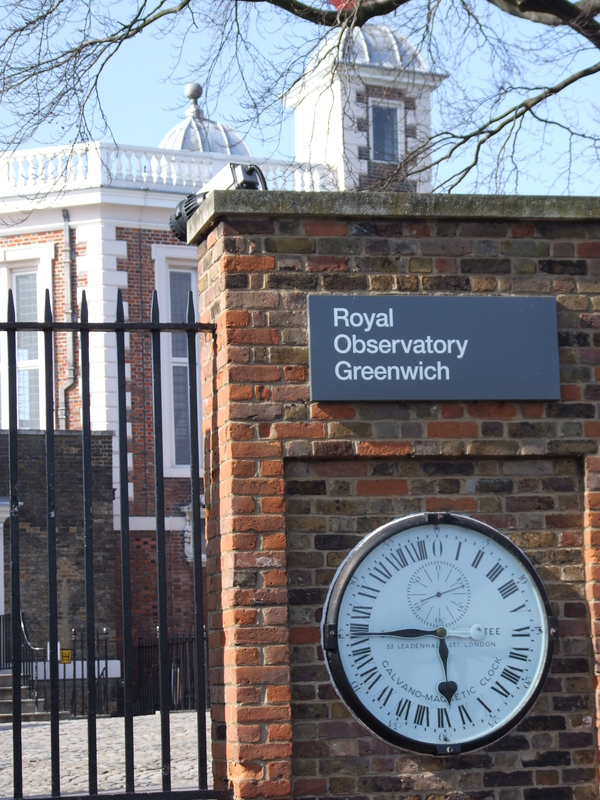 The Park also houses the Royal Observatory, the home of Greenwich Mean Time and the Greenwich Meridian Line (admission fee payable). To top it all, you can take in stunning panoramic views of London from the Park’s higher ground. Despite all this history, my son’s just discovered a love of swings, so we made a beeline for the children’s playground (how our priorities have changed…). 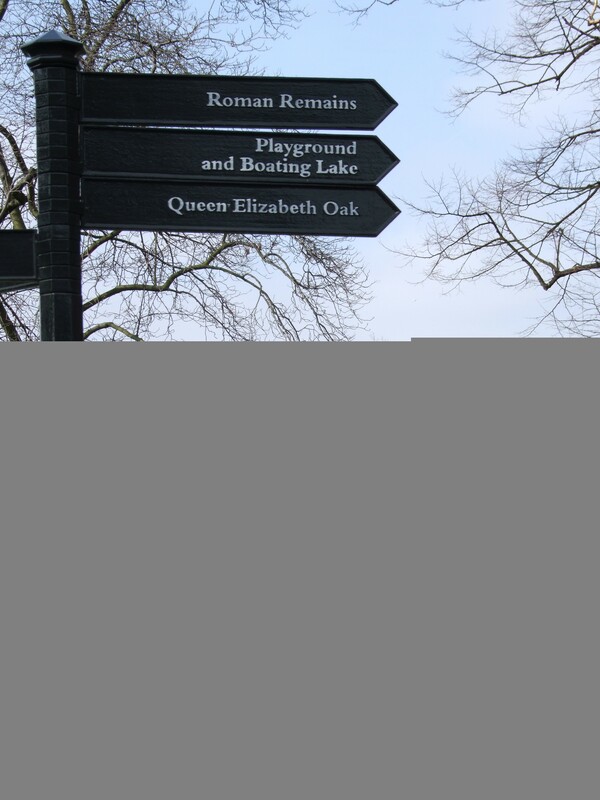 On the way there we spotted a signpost for the Park’s roman remains and went to take a look. Apparently the site of a former temple (the excavation of which featured on Channel 4’s Time Team), the area is currently overgrown and underwhelming. The playground, in contrast, was a great success – a large area with a huge range of play equipment, plus a large sandpit with waterfall, a refreshments kiosk, toilets and baby changing facilities. 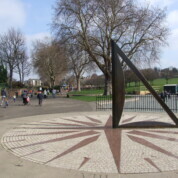 After we’d had enough of the swings we had a quick peek at the enormous modern sundial installed in 2000 next to the Greenwich Meridian, and headed off towards the National Maritime Museum, which neighbours the Park near St Mary’s Gate. The National Maritime Museum explores Britain’s relationship with the sea through the centuries. From the uniform Nelson wore at the Battle of Trafalgar, to the hundredth anniversary of the sinking of the Titanic; from polar exploration, to the trade in exotic goods and spices; the galleries cover a variety of fascinating seafaring themes. Interactive exhibits, such as those in the ship simulator gallery, will be sure to keep older children entertained. Unfortunately, the dedicated children’s gallery is currently closed for refurbishment, but is due to re-open later this Spring. Nonetheless, regular family activities are held in the Museum on Saturdays and Sundays. Although the Museum’s buildings date back to 1807, and were originally a school for the children of seafarers, we found the current site to be modern and spacious with excellent facilities for families with babies. The Upper Deck of Neptune Court on the first floor is a pleasant open area, covered with a glass roof that lends a bright and airy feel and provides an attractive setting for one of the Museum’s cafés. If you are looking for a family day out and the weather is good, then Greenwich Park is hard to beat as a destination in terms of its sheer size, choice of attractions and stunning views. A visit to the National Maritime Museum provides the perfect contrast to the Park – an impressively modern and well-designed Museum, it will appeal to parents and children alike, and best of all it has free entry! Admission to Greenwich Park and to the National Maritime Museum is free. Entry to the Royal Observatory in Greenwich Park (which we didn’t visit on this occasion) costs £7 (£5 for concessions) or you can buy an annual pass for £10. Entry to the Astronomy Centre is free. Greenwich Park has public toilets and baby changing facilities. The National Maritime Museum has baby changing, a feeding room and a buggy park. The Museum is accessible to pushchairs. Family activities take place on Saturdays and Sundays. See the Museum’s website for details. 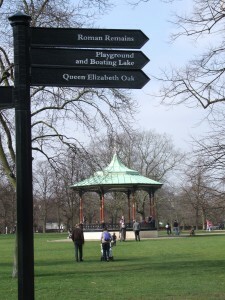 Greenwich Park has several refreshment kiosks serving drinks, snacks and ice creams, and a public café, the Pavilion Tea House. The Pavilion Tea House (located close to the Royal Observatory) serves hot and cold drinks, snacks and hot meals, including kids’ meals (prices are approx. £3-6). There is both indoor and outdoor seating and high chairs are available. The National Maritime Museum has a café serving hot and cold drinks, salads, snacks, hot meals and afternoon tea. As a rough guide a coffee costs approximately £2.25. Indoor and outdoor seating overlooks Greenwich Park and high chairs are available. There is also a branch of Paul Bakery on the Upper Deck of Neptune Court in the centre of the Museum. The Museum’s 16 Seconds West Brasserie offers a more formal dining option. Visitors to Greenwich Park are welcome to bring a picnic. Large groups (over 25 people) should notify the Park in advance. By car: Pay and display parking (£1.20 per hour, maximum stay 4 hours Monday to Saturday) is available via the Blackheath Gate. By train: The closest stations are Greenwich (national rail services to central London) and Cutty Sark (Docklands Light Railway). By riverboat: River boat services call at Greenwich Pier from Westminster, Embankment or Tower Piers.